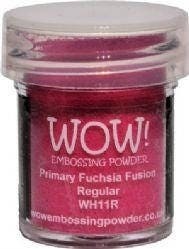 WOW EMBOSSING POWDER: WOW! Embossing Powder. Embossing powder is the perfect way to add new life to your embossing projects. Add it to wet ink, dry it, and watch it create a whole new dimension! This package contains one .5oz/15ml bottle of embossing powder. Available in a variety of colors (each sold separately). Non-toxic.